pseudo-normalization of T waves post-mi is actually a subacute phenomena (1-2 weeks) post-MI and the t-waves will be large and hyperacute. It is an expected event for the t-waves to eventually become upright with normal sized t-waves, this is not pseudo-normalization. First, you should know that when there is precordial ST depression due to subendocardial ischemia, it is not necessarily due to anterior wall ischemia. Data from stress testing shows that subendocardial ischemia DOES NOT LOCALIZE on the ECG, and usually is in leads II, III, aVF and V4-V6. But, again, this does not tell you which artery is involved. Second, ST depression in V1-V3, vs. V4-V6, is much more likely to be posterior than subendocardial ischemia. Third, patients at higher risk of NSTEMI (older, more risk factors, h/o angiogram with multivessel disease) are much more likely to have subendocardial disease (vs., for instance, a younger smoker). Fourth, patients with reasons to have demand ischemia (tachycardia, sepsis, GI Bleed, etc.) are much more likely to have subendocardial ischemia (like in a stress test); those with posterior MI are much more likely to present with onset of chest pain and with normal vital signs. Fifth, look for tall R-waves in V1-V3 (the analog of Q-waves in other locations). Sixth, an upright T-wave is much more likely to represent posterior MI, but probably signifies reperfusion of the artery rather than persistent occlusion. An inverted T-wave can be either subendocardial or posterior. Seventh, placement of posterior leads is very helpful. Take leads V4-V6 and place them at the level of the tip of the scapula, with V4 placed at the posterior axillary line (“V7”), V6 at paraspinal area (“V9”), and V5 (“V8”) between them. At lease 0.5 mm of ST elevation in 2 consecutive leads is very accurate for posterior MI. There is subtle ST elevation in II, III, and aVF. It is not 1 mm. There is no reciprocal ST depression or T-wave inversion in aVL, so the diagnosis of acute inferior MI is difficult to make by the ECG. There are, however, Q-waves in II, III, and aVF. These could be due to old or acute MI. There is no ST depression in the precordial leads, or significant ST elevation in the lateral leads, any of which would have supported the diagnosis of inferior MI. This is a non-diagnostic ECG. A repeat ECG 1 hour later is subtly changed, with some evolving T-wave inversion best seen in V5 and V6. A stat echocardiogram would have helped to make this diagnosis and facilitate timely reperfusion. Angiography and PCI were undertake 8 hours after the initial ECG and showed a completely occluded OM-1. Echo revealed inferior-posterior wall motion abnormality and troponin peaked at 100! It is not unusual for occlusions of the circumflex or its branches to show little on the ECG even though they represent a large amount of ischemic myocardium at risk for complete infarction. The circumflex territory is known as being “electrocardiographically silent”. How can you make the diagnosis? First, this patient had a known stent in the “marginal” artery and thought he was having a heart attack. In such a situation, when you know that the circumflex is the likely culprit artery, you may suspect that an MI will not be obvious on the ECG. In this case the ECG was very suspicious for MI, but not diagnostic. Therefore, additional diagnostic testing is warranted. Possibilities include: serial ECGs (which were done but still nondiagnostic), stat echocardiogram, or posterior ECG. Use of the PRIME ECG 80 lead body surface mapping shows great potential for improving diagnosis in such cases. By definition, this is a non-STEMI because there is not 1 mm of ST elevation in 2 consecutive leads. However, ST elevation is only an imperfect surrogate for complete acute persistent occlusion of an epicardial coronary artery without collateral circulation. It is neither fully sensitive nor specific. Even though the patient’s ECG did not meet criteria for STEMI, he had all the pathology of a STEMI. There are nondiagnostic T abnormalities in I and aVL, but little to suggest ischemia except that the precordial T waves are normalized. I was suspicious of LAD disease. Now the ECG is more normal appearing than ever. The troponin returned at 0.81 ng/ml, so the patient was started on heparin and eptifibatide, in addition to IV nitroglycerine and Metoprolol (and, of course, aspirin). His angiogram the next day revealed a 100% mid dominant circumflex occlusion that supplied the inferior and posterior walls. There was a large LAD that collaterally supplied some of the inferior wall. Echo showed an inferior-posterior wall motion abnormality. The troponin peaked at only 13, probably because of the collateral circulation from the LAD. How could we have gotten him to angiography and PCI faster? Patients with objective evidence of acute coronary syndrome (positive troponin or ECG) AND uncontrollable pain should get emergent PCI even if they do not have ST elevation. This patient did become pain free on maximal medical therapy, so PCI was not indicated. Fortunately, his MI was not large by biomarkers. Although he had a wall motion abnormality, this may go away over time. Notice the small Q wave in V1 followed by a very large R-wave, with a prolonged QRS. There is a wide S-wave in V6. Thus, there is right bundle branch block, which should never (unlike Left BBB) have any ST elevation. But here there is a large degree of ST elevation in V2-V6, I, and aVL. RBBB in acute STEMI has a very high mortality. The paramedics activated the cath lab from the field. The ST elevation has mostly resolved on this ECG, and were it not for the arrest and the prehospital ECG, this would not be a slam dunk diagnosis. There is still ST elevation in I and aVL, but it is subtle. There are abnormal T waves in V2-V4, with straightening of the ST segment which is typical of hyperacute T waves. Angiography revealed a very tight LAD stenosis with some flow (confirming the reperfusion that we see on the ECG). A stent was placed, and the patient had an excellent outcome with no wall motion abnormality. Learning point: the prehospital ECG is critical, as was early prehospital cath lab activation. Were it not for this prehospital ECG and the cardiac arrest, the diagnosis may have been significantly delayed. Had this happened, the artery may have re-occluded prior to angiography, with resultant recurrent cardiac arrest and/or shock and death. Here is a case of an 89 year old woman who had syncope but no chest pain or shortness of breath. 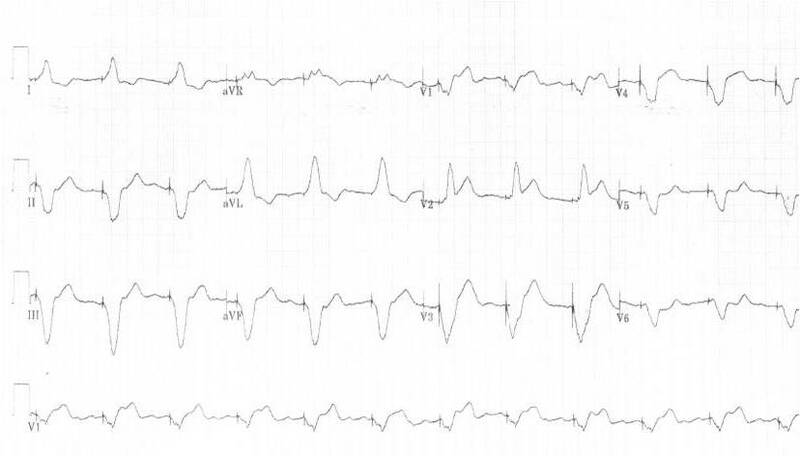 Her initial EKG (#1) shows some nondiagnostic ST depression in V4-V6, probably due to LVH. She has a troponin of 0.13 ng/ml (ref range up to 0.09). She is admitted, her trop peaks at 0.23, her next day EKG done 8 hours later is shown below (#2) and shows some terminal T inversion in V3, consistent with the positive trop and suggesting tight LAD occlusion but open artery (T inversions are “reperfusion T waves; an inverted T wave is a sign of an open artery and an upright T wave is a sign of occlusion or re-occlusion). Echo the next day is normal. She is diagnosed with “demand ischemia” and discharged home. Here there is 4 mm of ST elevation that can only be due to myocardial ischemia. If there is any doubt, then the presence of new ST elevation and T inversion in I and aVL should erase that. If there is still any doubt, the loss of R-wave amplitude in V2 and V3 should erase that as well. The inversion of the T wave in aVL and V2 suggests an open artery. However, this is a very strange looking Wellens’ T wave because of the marked ST elevation. The treating physician contacted the cardiologist immediately, but the cardiologist was not convinced, mostly because of the minimal symptoms and partly because it is not the classic morphology of anterior STEMI due to persistently occluded LAD, which should have upright T waves. Now the ST elevation is unmistakable, even with the persistently inverted T waves. But because the patient was asymptomatic, the cath lab was not yet activated. A bedside echo suggested anterior wall motion abnormality. This shows even more ST elevation. The patient was still asymptomatic. An initial troponin returned at 12 ng/ml. The cath lab was activated. There was a ruptured plaque with thrombus in the LAD, with some flow still (accounting for the inverted T waves). Fortunately, the physicians were attentive and kept ordering frequent serial EKGs. Learning point: some EKGs represent STEMI no matter what the symptoms, until proven otherwise by angiography. Below are several examples of hyperacute T waves. Case 1 (Hyperacute T waves with ST depression–LAD occlusion). The following is a perfect example of Anterior MI with LAD occlusion but WITHOUT any ST elevation. This is seen commonly, but only recently reported on by de Winter, Verouden, Wilde, and Wellens’ in a long letter to the New England Journal (NEJM 359(19):2071-2073; Nov. 6, 2008). The authors reported this morphology in 2% of LAD occlusions. The morphology is as follows: 1-3 mm of upsloping ST depression in leads V1 to V6 that continues into tall, positive symmetrical T waves, with normal QRS and loss of R-wave progression and with 1-2 mm ST elevation in aVR. Interestingly, they found that this was not a transient feature that later progressed to ST elevation, but that it remained static until angiography up to 50 minutes after the initial ECG. The mean time from symptom onset was 90 minutes. K levels were normal. MI was very large as measured by high CK-MB. Case 2 (Hyperacute T waves present AFTER ST elevation is resolving). This is the EKG of a previously healthy 40 year old man with one hour of chest pain and profound weakness and sense of “doom”. He has a history of HTN, smoking, and family history. Vital signs and exam were normal. This ECG show large symmetric T waves, best distinguished from those of early repolarization by the absence of large R-waves (in this case, the R-wave amplitude is very small). It also helps that there is inferior ST depression. There is some borderline ST elevation in leads V2 and V3. Similar to case 1, there is ST depression in leads V4-V6. This should be recognized as an EKG diagnostic for LAD occlusion. This shows much ST elevation in anterior leads and illustrates an underrecognized phenomenon: hyperacute T waves are not only present early after occlusion, as the STEMI is developing, but also after the ST segment elevates AND they are present early after reperfusion as the ST segments are falling. They may be the only remaining clue to a reperfused LAD occlusion. Case 3 (Hyperacute T waves misdiagnosed as Hyperkalemia). 49 yo man with 1 week of stuttering chest burning and tightness for 1-2 hours. Today the discomfort is associated with multiple episodes of vomiting and it is unremittant. The following EKG was obtained and hyperkalemia was diagnosed. The patient was treated with Calcium, Insulin, D50, and bicarbonate, with no change in the ECG. A bedside ultrasound revealed a possible anterior wall motion abnormality. The K returned at 2.9 mEq/L. There was an LAD occlusion that was opened and stented. Pure (Isolated) Posterior STEMI — not so rare, but often ignored! This is a 44 yo male with h/o HTN, CABG at age 34, and 2 drug eluting stents to the first diagonal graft 3 months prior. He presented at 1810 with chest pain 5 days after stopping clopidogrel (on the instructions of another physician). The following ECG (#1) was recorded, with ECG #2 as his baseline. #1 shows new marked ST depression in V2 and V3. The differential diagnosis is subendocardial ischemia with probably NSTEMI vs. posterior STEMI. By ECG alone, posterior MI is more likely because of maximal ST depression in right, as opposed to left, precordial leads. However, given the history of severe 3 vessel coronary disease it is prudent to start with medical management, then observe for resolution of pain, but to also obtain an immediate echocardiogram to ascertain which wall is involved. If pain or ECG findings do not resolve, or if there is posterior wall motion abnormality, then immediate angiography with PCI is indicated. In this case, maximal medical therapy was undertaken with Aspirin, clopidogrel, heparin, eptifibatide, metoprolol, and IV nitroglycerin and the patient was admitted to the CCU with cardiology consulted immediately. Chest pain resolved and angiogram was not done until the next day. It showed a 100% re-occluded SVG stent to D1; thrombus was suctioned out. Echo confirmed posterior wall motion abnormality. Max troponin was 47. ST depression is maximal from V2 to V4. This is due to posterior STEMI until proven otherwise. Unfortunately, it was treated as an NSTEMI for 2.5 hours until an echocardiogram showed a posterior wall motion abnormality. Cath revealed a 100% occluded circumflex. This was opened and stented, with the convalescent ECG below, which shows large upright posterior reperfusion T waves with a long QT. How can such delay be avoided? By recording posterior leads V7-V9, at the level of the tip of the scapula and at the posterior axillary line (V7), a position midway between this and the spine (V8), and a paraspinal lead (V9). Also, obtaining a stat echo. Most of all, recognize this ECG pattern as being by far more likely to be posterior STEMI than due to subendocardial ischemia, which has maximum ST depression in leads V4-V6. Here is a case of a 66 yo male with a history of CAD who presents with 1.5 hours of chest pain and is stable. The patient had rapid PCI of a 100% acutely thrombotically occluded mid circumflex which was opened and stented. There was 3 vessel disease. 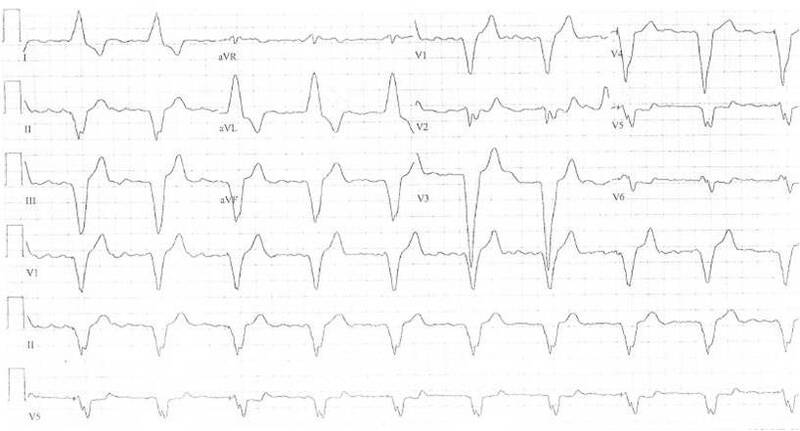 Notice also that in the first (pre-reperfusion) ECG of case 3, the T wave is not upright as in previous cases. Some authors claim that the T wave must be upright for posterior STEMI. Evidence for this is lacking. In fact, an upright T wave probably indicates reperfusion of the posterior STEMI, whereas an inverted T wave is the analog of a hyperacute T wave (still occluded) but recorded from the opposite side. Either can be present in posterior STEMI, depending on the state of microvascular perfusion due to recanalization or to collateral circulation. Acute anterior STEMI from LAD occlusion, or Benign Early Repolarization (BER)??? There is 1 mm of ST elevation in V2 and V3, so this meets the criteria for reperfusion by the ACC/AHA guidelines. Unfortunately, the majority of patients who meet such “criteria” do not have MI. The most common reason for ST elevation is early repolarization. If the mean R-wave amplitude from V2-V4 is less than 5 mm, then it is almost certainly MI. If greater than 5 mm, it is probably BER. A cutoff of 5 mm gives a sensitivity for MI of about 70%, but a specificity of greater than 95%. A more complex rule was derived using logistic regression, and involves 2 other variables: mean ST elevation at the J point (STEJ) from V2-V4, and computer measured QT-c (Bazett method). This relies on the findings that the mean ST elevation was higher in the MI group, and the mean QTc in BER is short (mean = 390 ms). If the formula: (1.553 x mean STEJ) + (.0546 x QTc in ms) – (0.3813 x mean RA) is > 21, vs. less than or equal to 21, then it represents MI with high sensitivity and specificity. Thus, the rule predicts that this is anterior MI. This shows unequivocal straightening of the ST segments, compared to the first ECG. This ST straightening results in T waves which are fattened and “hyperacute”. This is diagnostic of anterior STEMI. He had a 100% proimal thrombotic LAD occlusion with TIMI-0 flow. It was opened and stented. If the R-wave amplitude is greater than 5 mm, then it’s probably MI? Or did you mean to say that it’s probably BER? I have two cases of anterior STEMI vs. BER, and in both cases, it turned out to be anterior STEMI. In the first case, the mean R-wave amplitude in V2-V4 is less than 5 mm. In the second case, the mean R-wave amplitude in V2-V4 is greater than 5 mm. Would it be safe to say that the second case shows anterior STEMI in the presence of BER? Thanks for another great teaching point! Case 1. Classic anterior LV aneurysm morphology (Persistent ST elevation after previous MI). This 46 yo male presented with chest pain. There is 1 mm of ST elevation in V1-V3, but there are large QS-waves preceding the STE. Such QS waves are highly suggestive of old transmural MI, with subsequent akinesis or dyskinesis of the anterior wall. Acute MI, if early in its course (first 6 hours, at least), always has tall T-waves in addition to ST elevation. There is one retrospective study (Smith SW. American Journal of Emergency Medicine 23(3):279-287, May 2005) showing that the T/QRS ratio is significantly greater in acute anterior STEMI than in old anterior MI with persistent ST Elevation. The best criterion for differentiating was the sum of STE in V1-V4 divided by the sum of the QRS’s in V1-V4 (TV1+TV2+TV3+TV4 divided by QRSV1+QRSV2+QRSV3+QRSV4). If this value was <0.22,>0.36, then it is likely to be acute STEMI. The above ECG has a summed ratio of 0.05 and is clearly NOT an acute STEMI. It is important to know that only about 70%-80% of patients with the ECG morphology of “LV aneurysm” actually have an LV aneurysm, as defined by echocardiographic dyskinesis. “LV aneurysm” is far less common in this era of reperfusion, in which STEMI is not allowed to progress to full infarction (also known as “transmural” infarction, an old but useful term). The patient above had akinesis and had formerly had a mural thrombus, which is a common complication of an immobile wall which also may have post-infarction inflammation. This patient ruled out for MI with negative troponins. This 65 yo male presented with dyspnea but no CP. The lungs sound wet. The ECG is shown. There is quite a bit of ST elevation in the anterior leads, but it is preceded by very deep QS waves suggestive of old MI. Previous MI can have persistent ST elevation, and just like in Left Bundle Branch block and other entities, ST elevation may be exaggerated in states of tachycardia. Therefore, the T-wave to QRS ratio may also be exaggerated. Here the formula TV1+TV2+TV3+TV4 divided by QRSV1+QRSV2+QRSV3+QRSV4 = 0.27, substantially > 0.22, and would indicate acute STEMI. But one must be suspicous of a false positive in the presence of extreme tachycardia such as this. Also arguing against STEMI is the fact that there is no single T/QRS ratio (V1-V4) > 0.36. The difficult decision is this: is this an old MI with exaggerated persistent STE due to tachycardia, or is it an old MI with a new STEMI superimposed? Given that the BNP was > 5000 and the patient had no chest pain, and the high likelihood that such a morphology represented the former (not the latter) diagnosis, the patient was not set up for angiogram and reperfusion. It is evident that there previously was classic LV aneurysm morphology, but with much less ST elevation. The ratio here is 0.05. A previous echo had shown severe decreased LVF with an akinetic anterior wall. Clinicians correctly interpreted the first ECG as exaggeration of ST elevation of old MI due to tachycardia, stress, and exacerbation of CHF. Treatment of CHF resulted in a slowing heart rate. Follow up confirmed all troponins negative and resolution of ST elevation when the heart rate came down. This is a 58 year old male with 40 minutes of chest pain of acute onset. 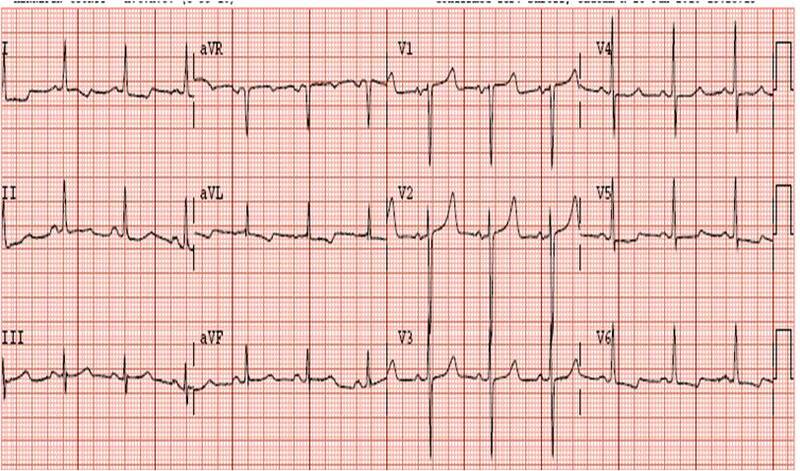 He called 911 and paramedics recorded a prehospital 12 lead ECG which showed a clear inferior STEMI (not shown, tracing could not be found). He was given aspirin and sublingual nitroglycerine, which improved his pain. The cath lab was activated by the paramedics. On arrival, the following ECG was recorded. There is 0.5 mm of ST elevation in inferior leads II, III, and aVF. In addition, the T-waves in II, III, and aVF are very large, significantly larger than normal in both height and width. To diagnose inferior MI, there must always be reciprocal ST depression or T-wave inversion or both in lead aVL. This is present here. Hyperacute T-waves can be present early, before the ST segment elevates, but they can also be present as ST elevation is resolving from spontaneous reperfusion. In this case the diagnosis was clear due to the prehospital ECG. But suppose there had been no prehospital ECG? Or if the first ECG had looked like this? Suppose the ST segments were on the way up rather than on the way down. Would you have diagnosed this? This identical ECG could be all the evidence you might have. If you find yourself in this diagnostic dilemma and you are uncertain of the diagnosis, remember that you can use serial ECGs, old ECGs, and immediate echocardiography to help in the diagnosis. While your blog does an excellent job of highlighting posterior STEMIs that were mistaken, are there any solid criteria to help provide a DDx between anterior or subendocardial ischemia and posterior STEMI? Will posterior ST alteration always be limited to v2-v4? This is a very good question, and not easily answered because there is very little solid research on this. First, you should know that when there is precordial ST depression due to subendocardial ischemia, it is not necessarily due to anterior wall ischemia. Data from stress testing shows that subendocardial ischemia DOES NOT LOCALIZE on the ECG, and usually is in leads II, III, aVF and V4-V6. But, again, this does not tell you which artery is involved. Second, ST depression in V1-V3, vs. V4-V6, is much more likely to be posterior than subendocardial ischemia. Third, patients at higher risk of NSTEMI (older, more risk factors, h/o angiogram with multivessel disease) are much more likely to have subendocardial disease (vs., for instance, a younger smoker). Fourth, patients with reasons to have demand ischemia (tachycardia, sepsis, GI Bleed, etc.) are much more likely to have subendocardial ischemia (like in a stress test); those with posterior MI are much more likely to present with onset of chest pain and with normal vital signs. Fifth, look for tall R-waves in V1-V3 (the analog of Q-waves in other locations). Sixth, an upright T-wave is much more likely to represent posterior MI, but probably signifies reperfusion of the artery rather than persistent occlusion. An inverted T-wave can be either subendocardial or posterior. Seventh, placement of posterior leads is very helpful. Take leads V4-V6 and place them at the level of the tip of the scapula, with V4 placed at the posterior axillary line (“V7”), V6 at paraspinal area (“V9”), and V5 (“V8”) between them. At lease 0.5 mm of ST elevation in 2 consecutive leads is very accurate for posterior MI. 2) Matetzky S et al. Significance of ST segment elevations in posterior chest leads (V7-V9) in patients with acute inferior myocardial infarction: application for thrombolytic therapy. JACC 1998;31 506-11. 3) Wung SF et al. New electrocardiographic criteria for posterior wall acute myocardial ischemia validated by a percutaneous transluminal coronary angioplasty model of acute myocardial infarction. Am J Cardiol 2001;87:970-4; A4. This 64 year old woman presented intoxicated with nausea and vomiting and epigastric pain, with no chest pain. She has a history of a stent, but unknown in which artery. She stopped taking clopidogrel 2 weeks ago because she ran out. Now the inferior T-waves have become mostly upright, in this case biphasic. There is some ST elevation, but it is not quite 1 mm in two consecutive leads. There is new ST elevation in lead V1, which in this context is diagnostic of right ventricular STEMI. This phenomenon is called “pseudonormalization of T-waves” because normal T-waves are upright (same axis as QRS), but become inverted in non-STEMI that is reperfused. They become deceptively upright (not normal, but “pseudo” normal) when the artery re-occludes. Thus, where reperfusion of the infarct-related artery (IRA) leads to T-wave inversion, if inverted leads become suddenly upright, this is diagnostic of re-occlusion of the IRA. There is nothing magical about 1 mm of ST elevation. ST elevation is used as a very imperfect surrogate for coronary occlusion. Coronary occlusion that does not spontaneously reperfuse or is not compensated for by collateral circulation will quickly lead to irreversible myocardial loss. Reperfusion therapy is indicated for occlusion, even when there is not 1 mm of STE in 2 consecutive leads. However, the specificity of the ECG for occlusion becomes less as the STE is less. So expertise in interpreting the ECG is particularly important for these cases. In this case, it was clear that there was a very unstable thrombus in the RCA or circ, and that if it was not 100% occlusive, it was very nearly so. The cath lab was activated, a 100% proximal RCA stent thrombosis was seen and the artery was opened. This also illustrates how chest pain or even discomfort may be completely absent in STEMI. Below is the post-cath ECG, showing T-waves are now inverted again (indicating reperfusion). This 51 yo male presented with Chest pain. There is ST depression, greater than 3 mm in some leads, in I-III, aVF, and V3-V6. aVR also has ST elevation. Deep and widespread ST depression is associated with very high mortality because it signifies severe ischemia usually of LAD or left main origin. This patient was treated with nitroglycerine, ASA, and heparin. His pain diminished substantially but did not go away altogether. An ED ultrasound showed an anterior, apical, and septal wall motion abnormality. Repeat ECG showed most of the ST depression resolved (but not all). There is no ST elevation, no evidence of occlusion that will cause imminent necrosis of a myocardial wall. But there is evidence of a very unstable atherosclerotic plaque that could completely thrombose at any moment. Also, his ongoing pain signified ongoing ischemia, which is an indication for immediate angiography and PCI. Therefore he was taken emergently (in the evening) to the cath lab. There was a severe ostial LAD thrombosis that was very close to the left main. He went for emergent bypass that evening and had a good outcome. ST elevation in aVR is often thought to represent left main occlusion. However, it really just signifies widespread and diffuse subendocardial ischemia which could be due to left main or 3-vessel disease, or severe proximal LAD disease. Left Main occlusion generally causes rapid death; most who survive left main ACS have some flow and thus often have widespread ST depression. Think of aVR as (-)aVR. (-)aVR is 180 degrees opposite aVR and thus is between leads I and II. Thus, if I and II have ST depression, the (-) aVR must have ST depression, and (+) aVR must have ST elevation. A 53 year old male with no previous cardiac history presented with sudden substernal chest pain with tingling of bilateral arms and dyspnea. There is very subtle and < 1 mm ST elevation in II, III, and aVF. The T-waves in these inferior leads are much larger than normal, with almost the same voltage as the QRS, and are “fat”. These are hyperacute T waves. Just as importantly, there is minimal reciprocal ST depression in aVL, with T wave inversion. This is diagnostic for inferior STEMI, even though it doesn’t meet the arbitrary criteria of 1 mm ST elevation in 2 consecutive leads. A 32 year old male presented with a 4 day history of dyspnea, cough, palpitations, and chest pain. He had an ECG done immediately (shown above). This showed anterior T wave inversions, a QTc of 431, and also T inversion in lead III. There is sinus tachycardia and an S1Q3T3. This is all highly suspicous for pulmonary embolism. . Oxygen saturation was 95%, there were some end expiratory wheezes. D dimer was 3000. A CT pulmonary angio confirmed large central PE. . Kosuge et al. (Am J Cardiol 2007;99:817-821) compared patients with ACS and PE who had precordial T wave inversions in V1-V4. They found that in this select population, negative T waves were observed in only 15 of patient with ACS compared with 88% of patients with Acute PE. . It is tempting to diagnose Wellens’ syndrome with anterior T wave inversions, but Wellens’ T waves simply look different, should have a longer QTc, generally don’t extend out to V6, and, most importantly, don’t have T inversion in lead III. . Of course the clinical scenario is most important. This 70 year old woman with a history of left bundle branch block presented with 10 hours of dyspnea. Notice there is QRS widening with a wide upright R wave in lead V6. That the QRS is not similar to V6 in leads I and aVL makes this an atypical LBBB. Nevertheless,, the same rules of concordance and discordance apply: the ST-T complex should go the opposite, or discordant, direction of the majority of the QRS. Notice there is concordant ST elevation in inferior leads. In addition, there is less discordant ST elevation in leads V1–V3 than is normal for LBBB. A normal amount of discordant ST elevation almost always produces an ST to S ratio of less than 0.20. The mean of normal LBBB is 0.09 to 0.11, but ratios of 0.07 to 0.15 may be seen. Thus, with a 26 mm S-wave in V2, the minimum amount of normal ST elevation is 26 x 0.07 or 1.8 mm. However, there is only 1 mm of ST elevation in V1 because of relative ST depression in leads V1 to V3. This is infero–posterior STEMI in the context of old atypical LBBB. This 72 yo male with h/o HTN, hyperlipidemia, and CAD, and h/o 4-vessel CABG 17 years prior presented with 8 hours of substernal chest pain radiating to upper back. Notice there is ST segment depression in II, III, and aVF. 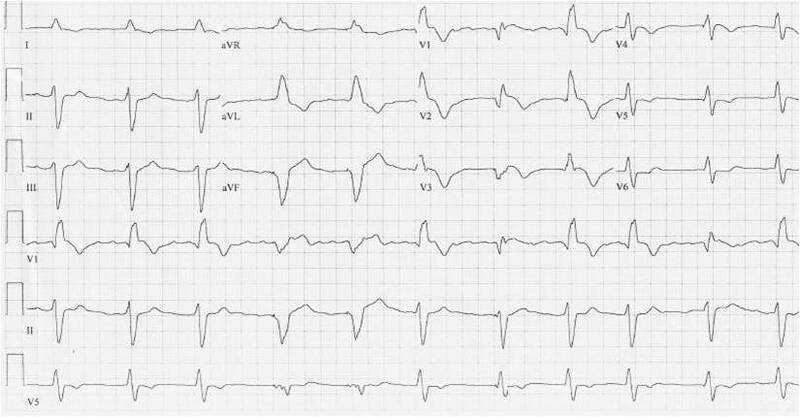 The QRS is normal, so any ST segment abnormality cannot be blamed on the QRS (i.e., ST depression is “primary”, not “secondary,” and the ddx of this is ischemia, hypokalemia, digoxin, and normal variant). The ST depression is somewhat “scooped” in appearance, suggesting hypoK or digoxin, but the QTc is 423 ms, so hypokalemia is unlikely (usually > 450 ms) and the patient was not taking Digoxin. ST depression of subendocardial ischemia does not “localize”. That is to say, for example, that “inferior” ST depression does not represent inferior subendocardial ischemia. When there is inferior ST depression from ischemia, it is invariably reciprocal to ST elevation in aVL (i.e., the high lateral wall). So if we look at aVL, there is indeed some ST elevation, about 0.5 mm. This is actually a significant amount of ST elevation because the R-wave is only 2 mm, and this is common in aVL. Furthermore, there is subtle ST depression in lead V3 (0.5 mm). There should NEVER be ST depression in leads V2 and V3, there is usually some amount of ST elevation. 0.5 mm of ST depression is likely to be 1.0-1.5 mm of relative ST depression. A colleague showed me this and I said that, because there is ST elevation in aVL and ST depression in V3, it is probably an obtuse marginal (OM) branch (of the circumflex) or near-occlusion. Appropriate management is to treat maximally for ischemia with ASA, heparin or enoxaparin (depending on institutional preference), clopidogrel if institutionally acceptable and epitifibatide if not. If the pain does not resolve, go urgently to the cath lab. If the pain and ECG findings resolve, then next day cath is acceptable. The patient had initial symptom control and was put in the ICU, but symptoms recurred and were refractory, so he was taken urgently to cath and was found to have ACS of the saphenous vein graft to the obtuse marginal. This was stented, and flow was TIMI-III after the procedure. Pre-procedure flow was not documented, but pain was resolved afterwards. Troponin I peaked at 8.5 ng/ml. Post-procedure ECG showed prominent T-wave inversion in aVL (analogous to Wellens’ T-waves in the anterior leads). Notice the ST depression in V3 is gone, but the ST elevation in aVL is more pronounced, as is the reciprocal ST depression. A 56 yo f with h/o HTN and hypercholesterolemia called EMS from home after onset of L chest pain radiating to the left arm. Before EMS arrived, she had “seizure activity” and became unresponsive. She was defibrillated successfully from ventricular fibrillation and developed a perfusing rhythm. She was intubated. She arrived comatose and in cardiogenic shock and the following ECG was recorded. There is a bradycardic rhythm of uncertain etiology, possibly a sinus pause with escape, and occasional PVCs. Now it can be seen that most of the precordial ST elevation is in V4R, much more than is present on the left side of the heart (V1R, which is equivalent to V2 on the left sided ECG. She was bradycardic and hypotensive. Normal saline bolus was given, with improvement in BP. .
Pressors were required, and the patient was transported to the cath lab with a door to balloon time of 60 minutes, where a proximal dominant RCA occlusion was opened and stented. She underwent therapeutic hypothermia, and emerged from coma. RVMI is always a result of RCA occlusion, and it is true that STE in lead III is usually higher than in lead II in RCA (as opposed to circumflex) occlusion, as seen here. ST depression in V1-V3 is only present if the RCA has branches to the posterior wall, which happens < 50% of the time. When there is concomitant RVMI and posterior MI, ST segment in V1 may be either elevated or depressed, depending on which dominates. Cardiac Arrest suddenly after blood loss, is it due to MI? Also, when the rhythm looks like torsade, it is usually not. This shows sinus rhythm with LVH and typical LVH repolarization abnormalities, with no evidence of acute ischemia. QTc = 440 ms. This shows Left Bundle Branch Block (new), with concordant ST elevation in II, III, aVF, V5 and V6, and also concordant ST depression in V2. This is diagnostic for transmural ischemia of the infero-postero-lateral wall. This explains the cardiac arrest. . Notice also the PVC (1st complex in V1, V2 and V3). It shows discordant ST depression that is EXCESSIVELY discordant. Thus, it is a PVC complex that reveals posterior STEMI. . Is this transmural ischemia due to hypotension from fluid loss? Unlikely, because the previous ECG, taken after quite a period of hypotension, showed no ischemia. . Is this due to ACS (plaque rupture with MI)? It seems unlikely only because it would be a coincidence. . The bleeding from the fistula has stopped. It is controlled. There is no risk now that it will bleed if anticoagulants and antiplatelet agents are given. . The patient should go immediately to the cath lab. . It seemed incredible to the physicians caring for the patient that she could be having an acute MI, and the LBBB confused them as well, so that there was some delay in cath lab activation, during which time a much more obvious ECG was recorded and an echocardiogram confirmed what an astute electrocardiographer would already know: there were new wall motion abnormalities. . At cath, an occluded circumflex was found and stented. There is 2-3 mm of ST elevation in leads V2-V4, and also ST elevation in V5, V6, I, II, and aVL. However, the ST elevation in anterior leads looks very much like early repolarization. I have derived and validated a 3 part rule to differentiate early repol from acute LAD occlusion (paper submitted). If 2 of the following 3 questions are answered “yes”, then it is MI with an accuracy of about 85%: 1) is the QTc > 392 ms? (here, yes) 2) Is the ST elevation at 60 ms after the J-point in lead V4 > 2mm (here, yes) 3) Is the R-wave in V4 < 13 mm (here, no). So by this rule, the ECG leans toward acute LAD occlusion. An 80 yo male presented with chest pain. There is clearly a ventricular paced rhythm. Normally in a paced rhythm, the QRS is usually all negative from V1-V6 because the pacing wire is in the apex of the RV and thus all depolarization goes away from the apex. 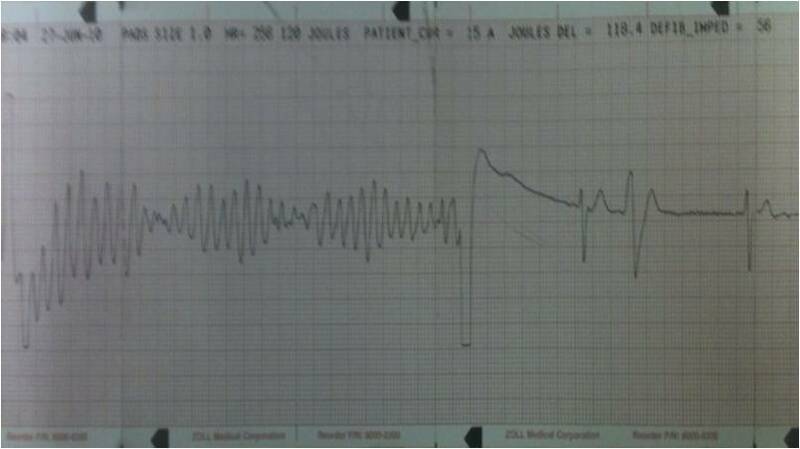 In the above ECG, the QRS in V2 is positive and all others are negative, as in the patient’s previous ECG below. This implies some problem with lead placement. Nevertheless, leads V1, V3, and V4 have excessively discordant ST segments. Though there is not a lot of data to support it, the ratio used for left bundle branch block seem to be applicable to paced rhythm. An ST/S ratio in V1-V4 > 0.20 I believe to be quite specific for LAD occlusion. 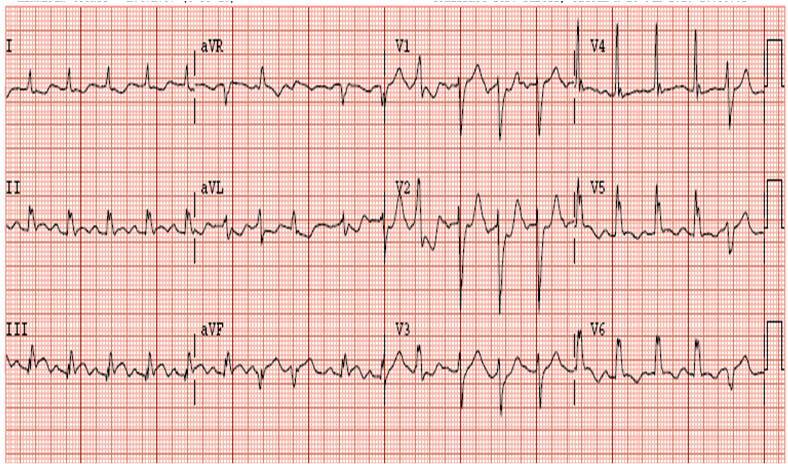 V2, though suspect because of the positive QRS, has a concordant ST segment, which is diagnostic of STEMI. The emergency physician needed to do some persuasion with the interventionalist, but succeeded and the patient was taken for angiography and PCI of a 100% LAD occlusion. This is a much more difficult ECG because only complexes 4 and 5 are paced now. The precordial leads have an RBBB morpholoyg, with some minimal persistent ST elevation in v2 and V3 with T-wave inversion, suggestive of reperfusion. Ischemic symptoms and a paced ECG with excessive discordance in V1-V4, with ST/S ratio > 0.20, is anterior STEMI until proven otherwise.